The four and five-string DBCV™ Electric Violins use a standard violin scale length of 328 mm. The fingerboard and bridge radius is 39 mm to allow for clean string separation in the the higher positions. The nut of the instrument is 27 mm wide, depending on the desire of the player. The separation of the strings at the center of the grooves is 10 mm at the bridge. At the nut, the separation is 4.9 mm. The measurement from the bottom of the pegbox to the top of the button is the standard 112 mm. The length of the instrument from the bottom to the top of the button is 14 7/8 inches. The total length of the instrument is 24 1/4 inches. Both the four and five-string models use Helicore Medium Tension Violin Strings. It is my goal to offer players the greatest number of options and price ranges when it comes to considering the purchase of an electric instrument. It is for this reason that this new page has been created. If you would like to own an electric instrument that sounds great, is less expensive than a custom-made instrument and feels exactly like your favorite acoustic instrument, here is the answer: An Acoustic-Electric Instrument! I will be happy to modify any existing acoustic violin, viola or cello so that it can be played both acoustically, and as an electric instrument. 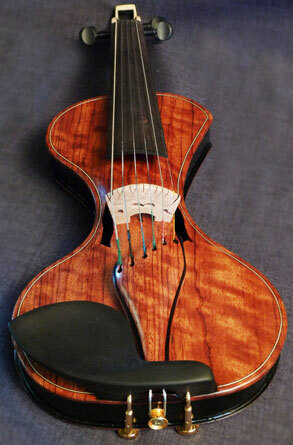 This is done by replacing the acoustic bridge that is currently on your instrument with an electric violin bridge. Note: If you want to modify an acoustic instrument, I recommend using a less-expensive instrument. The reason for this is that there will be a change in the acoustic sound of your instrument when a new, electric bridge is used with the instrument. I can make your acoustic-electric instrument (or any of my custom electric instruments) literally any color of the rainbow. Because some computer monitors display colors slightly differently than others, I ask that you send me an actual sample of the color you would like your instrument to be. You could use a paint color sample from a hardware store, a good photocopy of the color you desire or a picture from another printed source. In this way, the color of your instrument will be reproduced as accurately as possible. You have two options when choosing what type of color/finish you would like for your instrument. These two choices are: “Clear” – in which you will see the actual wood grain, and “Opaque” – which will allow the color of the instrument to be seen, though not the grain of the wood. “Clear” – Your instrument would be tinted with an analine dye or other medium that will change the color of the wood, and still allow the wood grain to be seen clearly. A top coat finish of varnish or lacquer, depending on the medium used for the color, will protect your instrument and give it a beautiful gloss. “Opaque” – Your instrument would be colored/painted with oil or acrylic paint or a custom-tinted lacquer. Depending on the medium used for the color, a varnish, lacquer or other clear top coat will be put over the color for a beautiful, protective finish. Some players desire the feel, shape and tactile landmarks of an acoustic instrument. An extension – of the same shape and in the standard location of the right upper bout (the “shoulders”) of a traditional acoustic instrument may be added for $125.00. I usually fit my instruments either L.R. Baggs or Barbera Transducer bridge pickup systems. For six and seven-string instruments, I use only Barbera bridges because of their exceptional tone quality. The instrument is connected with the amplifier and/or other electronics by a 1/4 ” jack located on the lower left side of the instrument.There is a ground wire extending from the tailpiece to the ground connection of the jack input to reduce ambient noise.The electronics are installed in the hollowed area in the lower back of the instrument. This area is paneled with either leather or velvet, and is where the engraved plaque stating the artist’s name, date of the instrument’s completion and the name of the luthier is located. All finished instruments are branded with the DBCV™ logo. These prices are for the slim instruments of my design. Prices include labor, fittings (pegs, strings, bridge, etc.) in addition to the finish for the instrument desired by the player and a brass plaque on the instrument giving the player's name, the date the instrument was completed and my company name. I will e-mail photos of the instrument's construction in progress, if desired. All instruments use a standard violin scale length. Instruments with a longer/specific scale length are quoted individually. Commissioned/personalized instruments are priced on an individual basis. Work such as inlay, engraving, drawings on the instrument or other specialized requests the player desires will be done for an additional fee, depending on the nature of the work requested. The fee for any work of this type will be quoted to the player prior to beginning the construction of the instrument. My unique "Plug-in Shoulder Rest Frame" is included with every violin/viola. All completed instruments are shipped securely in a suspension case. Shipping: The cost of shipping the completed instrument to the player either "Overnight" or "2nd Day Air" will be added to the price. A non-refundable deposit of 50% of the cost of the completed instrument is required at the time of the order. The remaining 50% is paid prior to shipping your completed instrument.